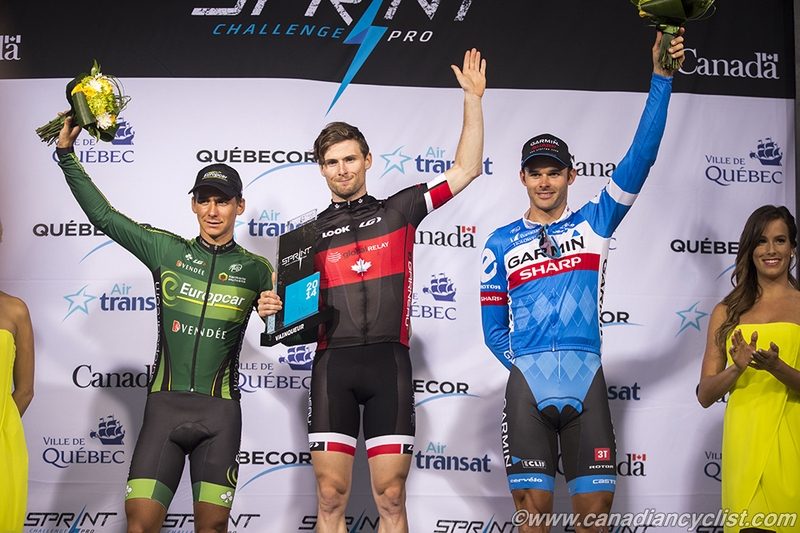 The only weekend of WorldTour racing in North America, the Grands Prix Cyclistes de Quebec et Montreal opened on Thursday with the Sprint Challenge. 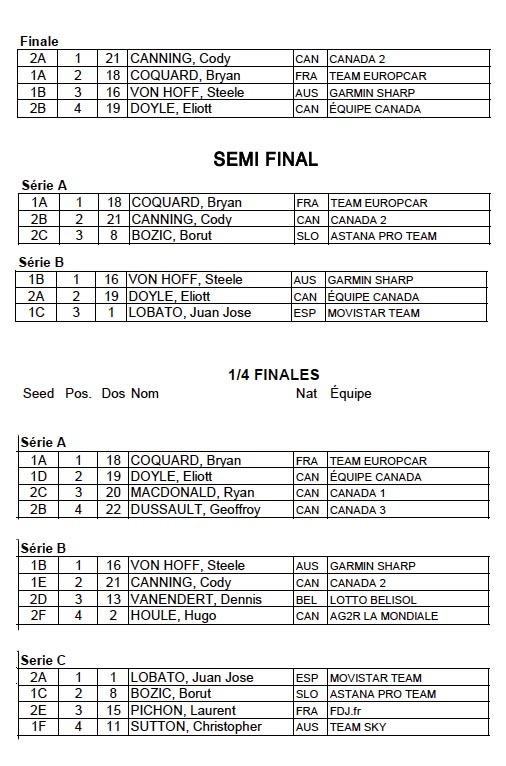 Canadian champion Cody Canning (Team Canada) won the overall title against a field stacked with WorldTour riders. 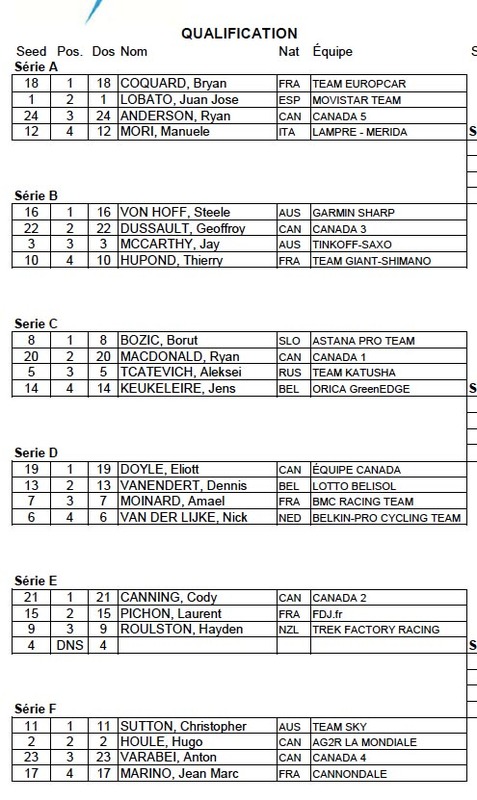 Bryan Coquard (Team Europcar) was second and Steele von Hoff (Garmin-Sharp) third, just ahead of Eliott Doyle (Team Canada). Heading out in heats of four, the riders play a tactical game down the opening straightaway, before the final 350 metre slightly uphill sprint to the finish. The top two move on to the next round, until there are just four left. Canning led from the front coming out of the 180-degree turn at the bottom of the course, and took advantage of a little lull in attention by the others to launch an attack 250 metres out. Coquard was reeling Canning in, but ran out of road at the finish line. "I had no idea of what I'd actually be able to do here," commented Canning. "It's a little bit of a tactical game out there, and I wanted to just control the race and play it to my advantage. It's an event that these guys [WorldTour teams] don't specifically train for, so everyone is sort of the same playing field. Everyone is moving so slow after the turn, that when you jump from the front you get a bit of a gap."